Not to be confused with Carborundum. 3) typically containing traces of iron, titanium, vanadium and chromium. It is a rock-forming mineral. It is also a naturally transparent material, but can have different colors depending on the presence of transition metal impurities in its crystalline structure. Corundum has two primary gem varieties: ruby and sapphire. Rubies are red due to the presence of chromium, and sapphires exhibit a range of colors depending on what transition metal is present. A rare type of sapphire, padparadscha sapphire, is pink-orange. The name "corundum" is derived from the Tamil word Kurundam, which in turn derives from the Sanskrit Kuruvinda. Because of corundum's hardness (pure corundum is defined to have 9.0 on the Mohs scale), it can scratch almost every other mineral. It is commonly used as an abrasive on everything from sandpaper to large tools used in machining metals, plastics, and wood. 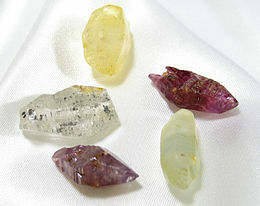 Some emery is a mix of corundum and other substances, and the mix is less abrasive, with an average Mohs hardness of 8.0. In addition to its hardness, corundum has a density of 4.02 g/cm3 (0.145 lb/cu in), which is unusually high for a transparent mineral composed of the low-atomic mass elements aluminium and oxygen. Corundum from Brazil, size about 2 cm × 3 cm (0.8 in × 1 in). Corundum occurs as a mineral in mica schist, gneiss, and some marbles in metamorphic terranes. It also occurs in low silica igneous syenite and nepheline syenite intrusives. Other occurrences are as masses adjacent to ultramafic intrusives, associated with lamprophyre dikes and as large crystals in pegmatites. It commonly occurs as a detrital mineral in stream and beach sands because of its hardness and resistance to weathering. The largest documented single crystal of corundum measured about 65×40×40 cm (26×16×16 in), and weighed 152 kg (335 lb). The record has since been surpassed by certain synthetic boules. Corundum for abrasives is mined in Zimbabwe, Pakistan, Afghanistan, Russia, Sri Lanka, and India. Historically it was mined from deposits associated with dunites in North Carolina, US and from a nepheline syenite in Craigmont, Ontario. Emery-grade corundum is found on the Greek island of Naxos and near Peekskill, New York, US. Abrasive corundum is synthetically manufactured from bauxite. Four corundum axes dating back to 2500 BCE from the Liangzhou culture have been discovered in China. 3 with a little chromium at temperatures above 2,000 °C (3,632 °F). In 1903, Verneuil announced he could produce synthetic rubies on a commercial scale using this flame fusion process. The Verneuil process allows the production of flawless single-crystal sapphires, rubies and other corundum gems of much larger size than normally found in nature. It is also possible to grow gem-quality synthetic corundum by flux-growth and hydrothermal synthesis. Because of the simplicity of the methods involved in corundum synthesis, large quantities of these crystals have become available on the market causing a significant reduction of price in recent years. Apart from ornamental uses, synthetic corundum is also used to produce mechanical parts (tubes, rods, bearings, and other machined parts), scratch-resistant optics, scratch-resistant watch crystals, instrument windows for satellites and spacecraft (because of its transparency in the ultraviolet to infrared range), and laser components. 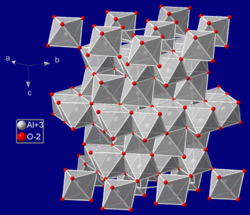 Corundum crystallizes with trigonal symmetry in the space group R3c and has the lattice parameters a = 4.75 Å and c = 12.982 Å at standard conditions. The unit cell contains six formula units. In the lattice of corundum, the oxygen atoms form a slightly distorted hexagonal close packing, in which two-thirds of the gaps between the octahedra are occupied by aluminum ions. Wikimedia Commons has media related to Corundum. ^ "Mohs' scale of hardness". Collector's corner. Mineralogical Society of America. Retrieved 10 January 2014. ^ a b Anthony, John W.; Bideaux, Richard A.; Bladh, Kenneth W.; Nichols, Monte C., eds. (1997). "Corundum". Handbook of Mineralogy (PDF). III(Halides, Hydroxides, Oxides). Chantilly, VA, US: Mineralogical Society of America. ISBN 0962209724. ^ a b Giuliani, Gaston; Ohnenstetter, Daniel; Fallick, Anthony E.; Groat, Lee; Fagan; Andrew J (2014). "The Geology and Genesis of Gem Corundum Deposits". Gem Corundum. Research Gate: Mineralogical Association of Canada. pp. 37–38. ISBN 978 - 0 - 921294 - 54 - 2. ^ Harper, Douglas. "corundum". Online Etymology Dictionary. ^ "Chinese made first use of diamond". BBC. BBC. May 2005. ^ Duroc-Danner, J. M. (2011). "Untreated yellowish orange sapphire exhibiting its natural colour" (PDF). Journal of Gemmology. 32: 175–178. doi:10.15506/jog.2011.32.5.174. Archived from the original (PDF) on 2013-05-16. ^ "Bahadur: a Handbook of Precious Stones". 1943. Retrieved 2007-08-19. ^ Farzin-Nia, Farrokh; Sterrett, Terry; Sirney, Ron. "Effect of machining on fracture toughness of corundum". Journal of Materials Science. 25 (5): 2527–2531. doi:10.1007/bf00638054. ^ "Fracture-Strength Anisotropy of Sapphire". Journal of the American Ceramic Society. 59: 59–61. doi:10.1111/j.1151-2916.1976.tb09390.x. ^ a b "Fracture of Sapphire". Journal of the American Ceramic Society. 52: 485–491. doi:10.1111/j.1151-2916.1969.tb09199.x. ^ "Corundum, Aluminum Oxide, Alumina, 99.9%, Al 2 O 3". www.matweb.com.